So last week or so, me and Christina went fabric shopping. Remember the "LOOT". Well she was telling me about this wonderful flicker group that swaps rare fabrics in trade instead of money. I watched for a few days, until I saw this lovely fabric. I have been collecting FMF since February. Of course it's all way out of print, and only my favorite fabric ever. I decided to make Sophie a quilt so I will always have the fabric near the family. 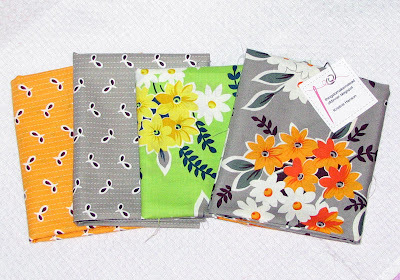 Anyway, I swapped some fabric of mine for these beautiful fat quarters, and added them to my collection. Also in the mail, I bought 1 yard each of the green dots, the brown dots, the brown leaves, and the green leaves. As well as some heather ross VW buses, and some vintage linen from Elizabeth over at oh fransson. How lucky am I. So this is my little collection so far. Some of it I am swapping on the flicker group to get what I don't have yet. 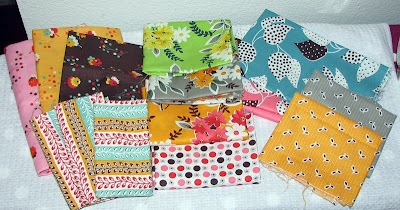 I am hoping to get as many from the line in FQ size as possible to fit in my wonky quilt. Do you have some?? Wanna trade? visit the group and see what I have left. I am also looking for some Heather Ross prints , scraps are ok to. So go now and feast your eyes! Love all of your fabric, and what fun to barter like that...awesome!!! Lucky you! What pattern will you do for Sophie's quilt? Brice is getting a heather ross quilt, I wish I had white mushrooms for it. Oh well. Oh look at all you wonderful fabric, I went over to look but you have to post a trade first, so not really sure what they have to offer or what i have someone else would like. I adore the idea, I need to take a peek at my fabric, is it just for fat quarters?